Recently, Cuba has been in the news as America’s relationship to the island just off the Florida coast changes dramatically. Fifty-five years ago this month, Cuba also dominated the headlines, as the Bay of Pigs crisis unfolded, with a Cherokee County native at the heart of the action. David Dean Rusk, born near Woodstock in 1909, was chosen by President John F. Kennedy to serve as secretary of state in late 1960. The son of two school teachers, Rusk attended Davidson College and studied international relations as a Rhodes scholar at Oxford University. Following his U.S. Army service in World War II, Rusk joined the U.S. Department of State, where he focused on political affairs in the Far East. Shortly after his election, Kennedy consulted with Rusk on potential nominees for secretary of state, never mentioning Rusk as a candidate. It was quite a surprise when Kennedy called the next day to offer him the position. Kennedy and Rusk’s first months in office turned into a trial by fire, as tensions grew between the United States and the Soviet Union, centered on Cuba. On April 17, 1961, CIA-sponsored forces landed at, the Bay of Pigs, on the south coast of Cuba, and attempted to invade Cuba and overthrow Fidel Castro’s Communist government. The operation failed and was a major embarrassment for Kennedy. 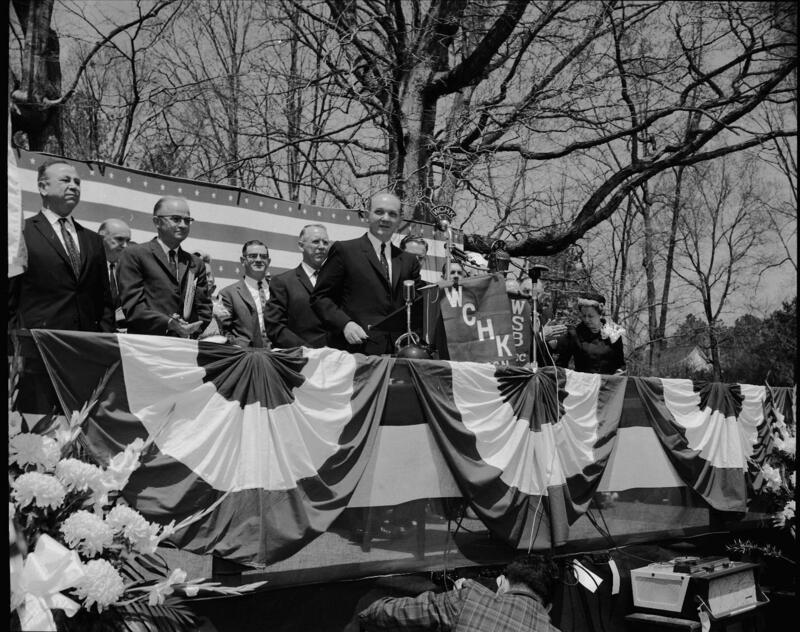 Only a few days after this crisis, Rusk returned to Cherokee County to speak at Reinhardt College’s homecoming celebration. 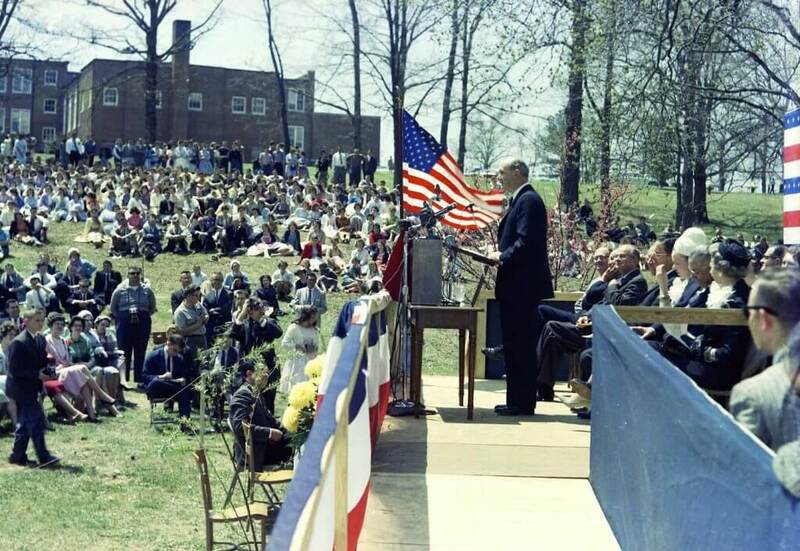 More than 4,000 people filled the college grounds as Rusk addressed the conflict in Cuba and urged the students to be of service to their country, a common theme in the Kennedy administration. Even after the resolution of the Cuban crisis, Rusk’s tenure as secretary was filled with turmoil. Rusk and Kennedy did not get along well. Although Rusk offered to resign several times, by 1963 rumors suggested that the president might dismiss him. In November 1963, everything changed when Kennedy was assassinated in Dallas. Rusk again turned in his resignation to President Lyndon B. Johnson, and was again refused. He enjoyed a closer relationship with Johnson than Kennedy, since both came from rural, southern backgrounds. Vietnam dominated the later years of Rusk’s term. His strong support for military action in Vietnam made him the target of anti-war protesters. Dean Rusk left office in 1969 as one of the second-longest serving secretaries of state (he shares the honor with William H. Seward; they both served for seven years and 364 days). He returned to his home state, teaching international law at the University of Georgia. He retired from there in 1984, and died a decade later. April 20, 1961. Local radio station WCHK and Atlanta station WSB covered Dean Rusk’s speech at Reinhardt College’s Homecoming celebration. In addition to being a Cherokee County native, Rusk had close ties to Reinhardt—13 of his family members graduated from the Waleska institution. April 20, 1961. A large crowd gathered on the Reinhardt campus to hear Dean Rusk speak, only days after the Bay of Pigs crisis in Cuba. President Kennedy selected Rusk as his Secretary of State shortly after taking office in late 1960.